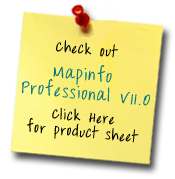 Mapping software for desktop, intranet and internet applications for territory analysis and development. Convert text data (address, city, state and Zip Code information) into location-based intelligence via Geocoding. Alteryx Allocate Demographic Analyzer, the world-leading tool to access, compile and compare disparate data. Generate data at any level of geography that can be immediately mapped, reported or ranked. Generate Drive-Time trade areas, by minutes or miles, easily and quickly! Track current and prospective customers' behavior, demographics and lifestyle profiles to assist in future territory development or site location analysis. Demographic Variables from multiple vendors (AGS, Synergos PopStats, Pitney Bowes Business Insight) including census data, current year data and 5 year projections plus 24-hour average annual daily Traffic Counts. SIC/NAICS business location data for mapping and target marketing mailing efforts. Healthcare Data for hospitals, nursing homes, assisted living as well as DRG data can be used for age specific franchisors. First-ever commercial release of data retrieval software for the People's Republic of China 2000 Census. Organizations can now gain access to Chinese demographic data through an easy-to-use, highly customizable software tool. Need a have a map created, give us a call! We do it all! Copyright 2008 IntelleVue LLC, All Rights Reserved.